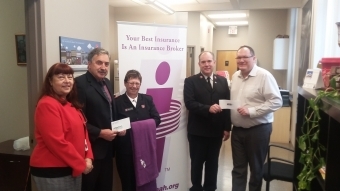 The season of Giving Has Begun and the Insurance Brokers Association of Hamilton (IBAH) are thrilled to announce the BIP The Town Magenta campaign! The Insurance Brokers Association of Hamilton’s “BIP The Town Magenta” Campaign has kicked off with a donation/matching donation to The Salvation Army of Hamilton! Acumen Insurance Group was the first to reach out for this great opportunity to top up your charitable donations this year! It was a great pleasure of mine to spend some time on November 29, 2016 with Sal Bagazzoli of Acumen Insurance Group and Salvation Army representatives; Judy Dolbec, Major Gift Representative,Major Pat Phinney, Divisional Secretary for PR & Development & Major Robert Russell Executive Director of the Booth Centre. The IBAH matched the very generous donation of $500.00 from Acumen Insurance to total a donation of $1000.00! During our visit, Major Robert Russell was kind enough to take us on a tour of the facilities to show us all of the behind the scenes efforts the Salvation Army put out to serve the Hamilton Area. It was truly an honour and privilege to be a part in helping such a great organization. Every dollar helps with the charities that do such great work in our communities. If your brokerage plans on doing any donating to a local charity at this time of year, please contact me and the Insurance Brokers Association of Hamilton will match up to $500.00. At this time of year, the need of our communities puts a greater stress on the services provided by local charitable organizations. Let’s show our communities that we can help in their times of need!